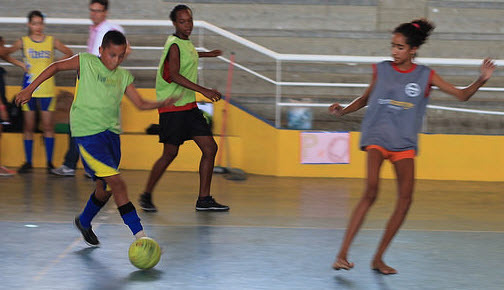 Founded in 2003, the Instituto Fazer Acontecer is a Civil Society Organization of Public Interest (OSCIP) promoting sports activities and training in human rights to young people living in areas with low HDI. Our work perspective is to educate through play and fun, offering opportunity for social inclusion and development of personal skills to the young participants of the program. With this work philosophy, we have already served more than 6,000 boys and girls over the past 10 years. We have strategic partnerships and institutional support from the Government, which allows the organization to offer sports oriented educational activities, contributing to low-income adolescents to become agents of their own role in society. We use the playful and educational side of sport to spread values such as solidarity, respect, honesty and cooperation, thus promoting equal participation of boys and girls. Through our Program Sport is Fun, we can train, meet and disseminate knowledge for teachers, socioeducadores and youth throughout Brazil and abroad. Twice a week young people will play 20:15 of soccer. A day of celebration will also take place when a different city comes to visit us, and then all young people from both cities join to play 20:15 of soccer. Finally, in the beginning of July, a 10 city festival will take place where more than 200 young people will attend. Instituto Fazer Acontecer has always embraced the philosophy of fun, fair & safe play for all in sports and in life. We have a mission to promote recreational educational activities through sports for education for human rights and public policy changes. We believe that all sport activities must be mixed, where boys and girls mix without distinction. We also believe that there should be no referees so young people have to develop the ability of negotiate and make agreements. We stride to pass to young people four core human values: responsibility, cooperation, honesty and respect. The number of girls interested in sports is growing at an amazing rate. Therefore it is important to promote girls integration in sports alongside boys. It is important to provide a safe environment where girls can shine, a place where they can have fun, be supported, and grow as athletes and as community members. Sports are probably one of the activities that young people like the most. Through sports we can achieve e a lot, including reducing violence; in particular, from men towards women. We are a charity and will not be collecting money from those we serve. Let´s all have fun while playing sports.